love bread in that house...they must, they must. Well of course you can guess what happened next. All it took was a little post inspiration and the course of the day was set. Pita bread anyone? Make sure you visit her blog for a link to the recipe. harder than it actually is. There are only a handful of ingredients and once the dough is prepared you just have to sit back relax. 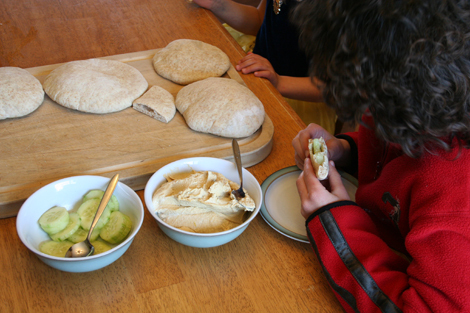 Unless of course you get the idea craving for fresh hummus to go along with the pitas. It helps after consulting the said hummus recipe to have tahini paste in your fridge (don't we all??) and sesame oil. Staple ingredients right? Oh and while I was kicking around my fridge crisper looking for that darn lemon, I stumbled upon a long english on the verge of extinction so you probably know what happened next. Yup, washed, peeled, and then with a bit of olive oil, red wine vinegar and a touch of s & p (salt and pepper) we were ready to sit back. 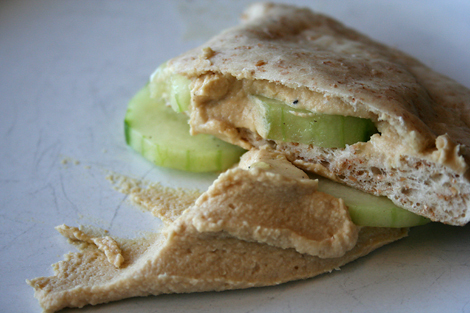 pitas with fresh hummus & cucumbers. Yum. The kids loved them. I loved them. Can't say I'll be doing store bought again. It's a shoe-in for a repeat. yay! I have converted another handmade pita family! THey are so much better fresh! i made 3 batches yesterday and distributed then to pattyjean (due anyday) and my neighbours... share the love. OHhhh that looks good. I'm going to try it! 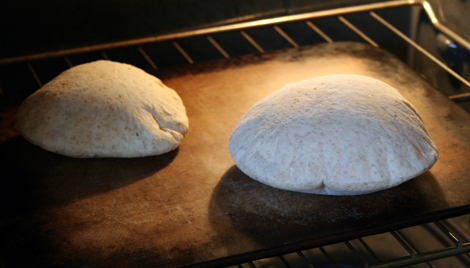 We're huge pita fans at this house and I can only imagine the homemade version is so much better tasting that bought! Yummy...your pita bread looks so good! We so appreciated the "love"! We were eating pitas all weekend - mmmmmm - the white onces were like pastry, and the whole grain one's we had with hummus or made into small pizzas! Yeah, so much better and way fresher. stuffed them with cheese & veggies. You are a lucky girl, with a good friend ;) I love the pizza idea. Yum you just made me hungry & I do not have time to stop & make pita bread when I have to be packing! that it is a trip :) thank you for dropping by.